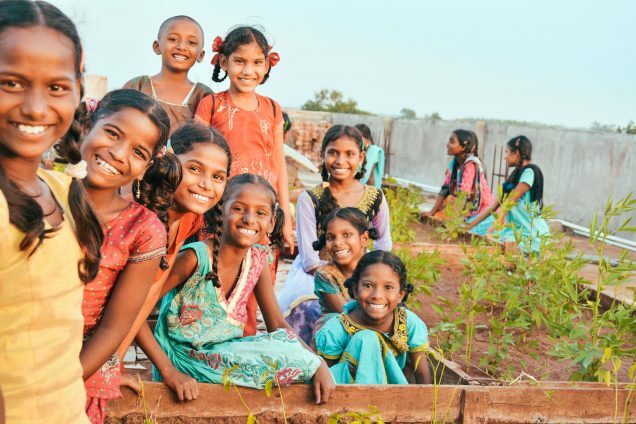 Photo: Girls from our India Girls Home are excited about the rooftop gardening project which brings them fresh organic ingredients for their daily meals. Today we bring you the good news that thanks to our native team’s hard work in preparing the ground level gardens and our rooftop box gardens for the current planting season, both of our gardening projects are flourishing. We are currently growing tomatoes, okra, green chilies, eggplant, cucumber, and curry leaves in both the rooftop box gardens and the ground level gardens, and we look forward to bountiful harvests in November. We are hopeful that we will draw a good profit (in savings) from the gardens, and we are thankful that the harvests of organic vegetables from our gardening projects add nutritious ingredients to the children’s meals. We also drilled a new well at our farmland to improve irrigation, to help keep the land cultivated for growing vegetables before each rice planting season. Our native team also prepared the farmland for the rice planting season, and we expect a good harvest of rice in January. We will also use the rice in the children’s meals, which enables us to save a lot of money that we would normally have to spend to buy rice at the market. Rice is a great source of sustainability since the average Indian consumes about 6.25 kgs (14 lbs.) of rice per month, or about half a pound of rice per day. 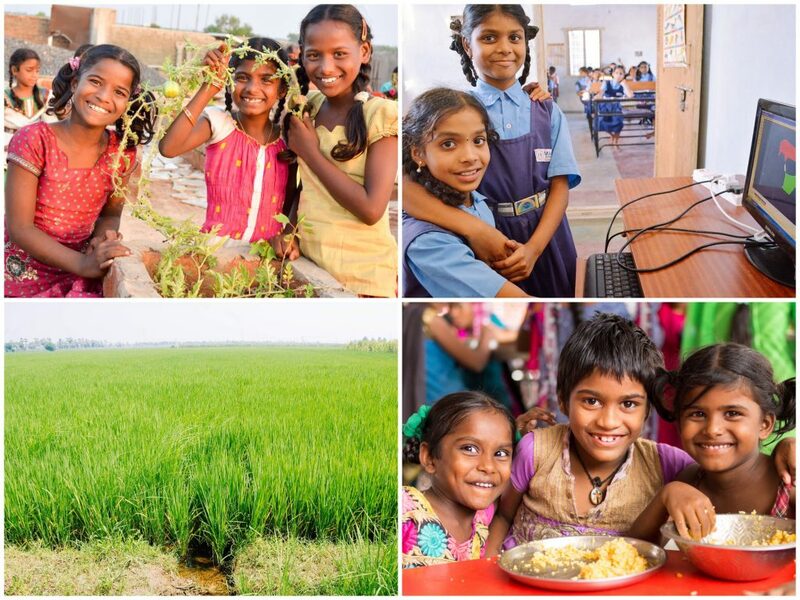 The children at our Hope Center and at our orphan homes consume 7,800 kgs of rice in their diets every year. Rice combined with lentils, another staple in the Indian diet, offers a nutritious source of complete protein, fiber, iron, and other essential minerals as well as Thiamin, Riboflavin, Niacin, vitamin B6, and Pantothenic Acid. Rice is both a source of profit and health, blessing our children’s lives. In other good news, we are in the process of adding a second level to our Children’s Hope Center in Hyderabad. Currently we are using the existing ground floor and its two small rooms for a study hall and a computer lab, but it’s been too crowded for the 43 children enrolled this year as we’ve tried to use the same study hall for preparing and serving meals. The additional second level will have 2 rooms which will become the new study hall and computer lab, giving the children a more comfortable and peaceful environment to do their studies and excel in their education. We will transform the ground floor to consist of our kitchen, the dining hall, and a small office. Photo inset: (Top-left): The harvests of organic vegetables from our gardening projects add nutritious ingredients to the children’s meals. (Top-right): Our Children’s Hope Center in Hyderabad offers local children in the slum colony a scholarship program and an after-school care program. (Bottom-left): Our native team has prepared the farmland for the rice planting season, which when harvested will be used in meals at both our Hope Center and at our orphan homes. (Bottom-right): Girls at our orphan home enjoy mealtimes together. Through the work of The Children’s Hope Center, we rescue children from child labor which is one of the leading precursors to child trafficking in India. The model of the center is based on education assistance — a scholarship program and an after-school care program. We provide the children with everything they need to enroll in a local school: uniforms, shoes, backpacks, and school supplies. Then we pick them up from school, and our teacher and her assistant help them with their homework in a classroom setting. They leave each evening after eating a fresh-cooked meal. It’s in this nurturing environment that our Children’s Hope Center is bringing just that — hope, to the children of this slum colony located on the edge of the city’s largest landfill. We are happy to share the story of one of the children who currently benefits from our Children’s Hope Center program. Ramya, who is in the 6th grade, lost her father when she was a young child. Her mother has been working as a housekeeper in many different homes. It was very difficult for Ramya to go to school, especially since her mother could not afford to buy her school books. But because of the support she and her mother have received from the Hope Center, Ramya is able to attend classes at the local school, and now she is very thankful and happy. Ramya and all of the children enrolled in the Hope Center recently completed their quarterly examinations and did very well. In the words of our field director, “This school year is going on in good progress, all of our children are studying well by the grace of God. We were able to see some merit in their progress report, and they are developing physically, mentally as well as socially along with education.” We are deeply thankful for your prayers and faithful support, and we look forward to reporting back with good news about our garden harvests, and how the lives of our children improve with many blessings.